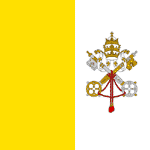 List of popular Vatican City newspapers, online current va news sites in Italian and English languages. Get latest Breaking news about Vatican City's people, politics, pope, tickets, development, economy, attractions and all activities from Newspaperlists. The Roman Observer is the daily newspaper of Vatican City State published in nine different languages distributed over 129 countries. Daily newspaper in Italian language, Weekly in English, Spanish, French, German, Malayalam, Portuguese and Monthly news in Polish published by the Holy See.